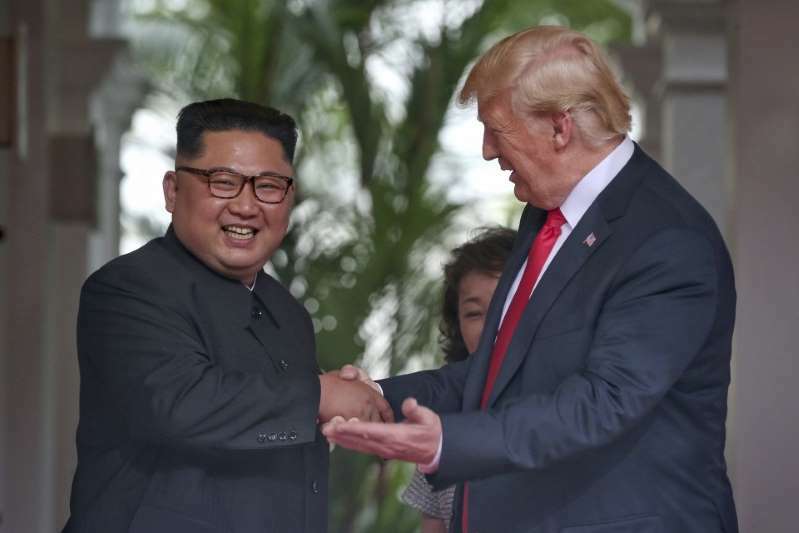 North Korea appeared unwilling Sunday to respond harshly after President Trump reversed course to declare it still a threat, pledging that its leader Kim Jong Un's regime seeks a “new era” with the United States but offering no specific plans toward dismantling its nuclear program. The comments also did not address promises by North Korea to return the remains of some U.S. military personnel from the Korean War. On Saturday, the U.S. military sent 100 wooden coffins to a U.N.-supervised area in the demilitarized zone separating the two Koreas in anticipation of receiving some of the remains. A report in Uriminzokkiri, a North Korean website that reflects the views of Kim's regime, urged both sides to move ahead with “faithfully implementing” the joint declaration from the June 12 summit in Singapore between Trump and Kim. But North Korea has yet to clarify its interpretation of denuclearization in the region. In the past, Pyongyang has defined it to include an end to the U.S.-South Korea military alliance and U.S. withdrawal of its nuclear umbrella protecting South Korea and Japan. “We will conscientiously fulfill our responsibility to address decades-long tensions and hostile relations, and open a new era of the North-U. S. cooperation,” the Uriminzokkiri report added, without mentioning North Korea’s nuclear program or Trump. Trump on Friday cited an “unusual and extraordinary threat” posed by Kim’s regime and maintained U.S. economic sanctions on North Korea. Trump’s notice to Congress was in sharp contrast to his post-summit assertions that North Korea was no longer a nuclear threat to the United States. “The path to thoroughly implementing the North-U. S. joint statement is the path to securing the common interests of the peoples of the two countries, and peace, security and prosperity on the Korean Peninsula and in the world,” said the Uriminzokkiri report. According to the Defense POW/MIA Accounting Agency, 7,700 American service members remain unaccounted for from the Korean War, and the remains of about 5,300 are believed to be located within North Korea. North Korean officials have said they have the remains of about 200 U.S. service members that they have recovered since the active conflict with the United States ended. Repatriation of remains has occurred in the past, but only sporadically.